Glenn Ferguson was unimpressed with his Ballymena United side's performance in Friday night's defeat at Dungannon. Picture: Press Eye. Glenn Ferguson blasted the performance of his Ballymena United players as “unacceptable” in Friday night’s 1-0 defeat at Dungannon Swifts. 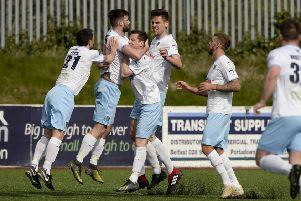 The United boss launched a broadside as the Sky Blues once again failed dismally to bring their heroics in cup ties to the bread and butter of the Danske Bank Premiership. Terry Fitzpatrick scored an unlikely headed winner for Dungannon as United suffered their first league defeat at Stangmore Park for four seasons. “We got exactly what we deserved from the game, which was nothing,” fumed Ferguson. “There is nothing from the game that we can take as a positive. “The players will go home and they will use the conditions as an excuse. They will say the pitch was bad, they will say the wind was strong, they will say it was a poor game to play in – and that’s just an easy way out. “Dungannon wanted it more than us and I told the players that. “We cannot just turn it on one week, off the next and back on again - it doesn’t happen like that. “I didn’t lose my temper but I was straight and honest with the players about how I felt they went about their business. “They might think it’s an end of season league game but the league is very important for us - it’s all about picking up points. Ferguson also spoke of his frustration after Eamon McAllister was booked for what referee Raymond Hetherington deemed a dive after the winger went down in the penalty area under a challenge from Jamie Glackin. “We thought it was a penalty, Darren Murphy thought it was a penalty, but the referee thought it was a dive. “However, we end up talking about referees all week and it’s not about that. “I’m more worried about our performance, it just wasn’t good enough,” added Ferguson.